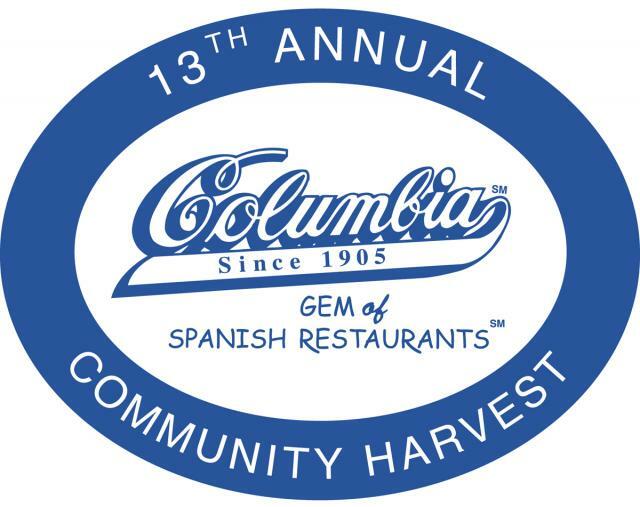 Let your appetite do the giving while you support local non-profit groups in Florida by dining at any Columbia Restaurant or The Columbia Cafe during the entire month of September for lunch or dinner during the 13th Annual Columbia Restaurant Community Harvest program. Through this program, The Columbia donates 5% of all guests’ lunch and dinner checks to the charitable organizations chosen by their customers during the month of September. The Community Harvest takes place in all of the Columbia Restaurants; Tampa’s Ybor City, Sarasota, St. Augustine, The Pier in St. Petersburg, Sand Key on Clearwater Beach, Central Florida’s Town of Celebration, and at the new Columbia Café on the Riverwalk in Downtown Tampa. And in case you didn&apos;t know, all Columbia locations are open 7-days a week for lunch and dinner. Here&apos;s a bit of background on the Columbia, which everyone should know! The original Columbia Restaurant was founded in 1905 in Ybor City and is Florida’s oldest restaurant. Locations include the flagship restaurant in Tampa’s historic Ybor City, St. Armands Circle in Sarasota, the historic district in St. Augustine, The Pier in St. Petersburg, Sand Key in Clearwater Beach, Central Florida’s town of Celebration, and the Columbia Café on the Riverwalk in Downtown Tampa. All Columbia Restaurants are owned and operated by the Gonzmart family, fourth and fifth generation members of the founding family. So there you have it...a great reason to go and enjoy some amazing food! Keep checking back here for more great things to do in Tampa Bay and other Tampa Bay area events.